When I was little, Christmas lights were the only thing that I cared about. Actually, Christmas lights and tractor sprinklers. I alternated my obsessive-compulsive behavior with the seasons. Not much has changed in the last 30 years. So I'd wait all year for "Christmas Light Season" and then I'd make my poor Mother drive me all over town so we could go "Christmas light looking" which I'm sure was super fun for her to chauffeur me around going five miles an hour so that I could inspect every single display in town. She never complained. My sister bought us the Santa and reindeer! It was always my dream to have tons of Christmas decorations and gaudy lights. Particularly the coveted blow mold manger scene. Christmas is my favorite season and I was lucky enough to find someone who shares my obsession. Gary loves Christmas even more than I do. He’s one of those people that folds wrapping paper with hospital corners and makes his own bows. 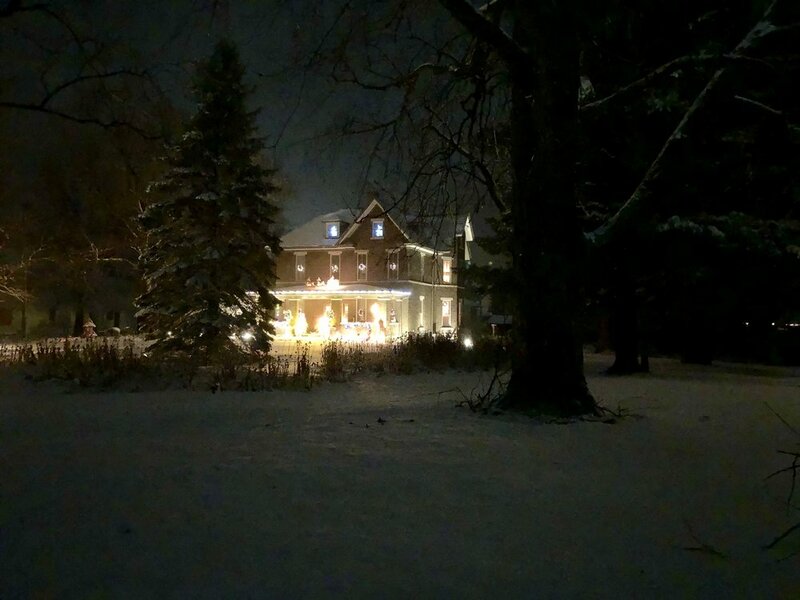 We've been collecting vintage Christmas for the last 12 years because we knew that one day, we'd move to Iowa and buy a big old house that we could decorate with our cultivated Christmas hoard. It’s good to set realistic goals. Our 1,700 square foot attic is completely full of Christmas decorations (plus Clarice and a couple of dead bats). Whoever said you can’t buy happiness clearly never won a box of mint condition pink Shiny Brite ornaments on eBay! That’s all Christmas... Mariah Carey is in one of those boxes. We are so festive that we have two manger scenes in our front yard this year! Now we look like a crazy religious cult is housed inside and I don’t care (I am in the process of writing a book about a nun so that totally counts) because manger scenes are so beautiful! We were randomly driving through Harmony, MN last month and saw a sign for an auction. We decided to stop in to see what they had and... there was a 14-piece manger scene complete with camels and sheep, two snowmen, three Santas and a giant lighted star of Bethlehem! Jesus took the wheel and we left the auction with two carloads of Christmas decorations for about $80. Our other manger scene is one of my favorite Christmas items. It belonged to the Kruse family who used to own the Calmar Guesthouse and they gifted it to us. It's huge and really old and special. Yes, that’s a 6’ Frosty in the dining room. Things didn't quite work out as planned this year because of the continuing disaster at our home. Month nine of construction and still no kitchen. We are still using our delightful little makeshift kitchen in the library. It's weird and unsanitary but whatever. We haven't died or needed tetanus shots (yet) so I'm calling it a Christmas success. 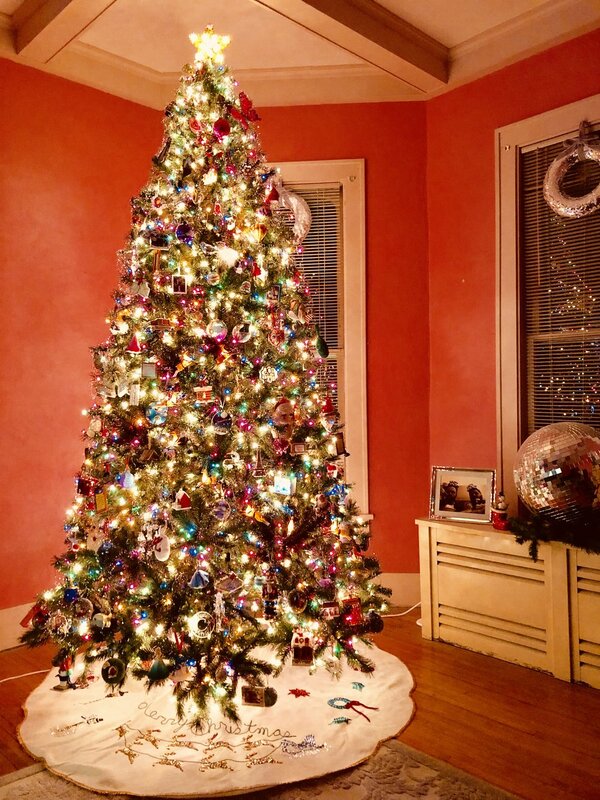 We are trying to make the best of it so we put up one tree this year in the living room and decorated the main hall. I don't remember if the Schliekers stopped decorating (maybe they moved away?) or when we stopped driving by but I hope someone drives their kids by our house and it makes them feel as happy as my Mom and the Schliekers made me. Merry Christmas from Gaye Gardens! 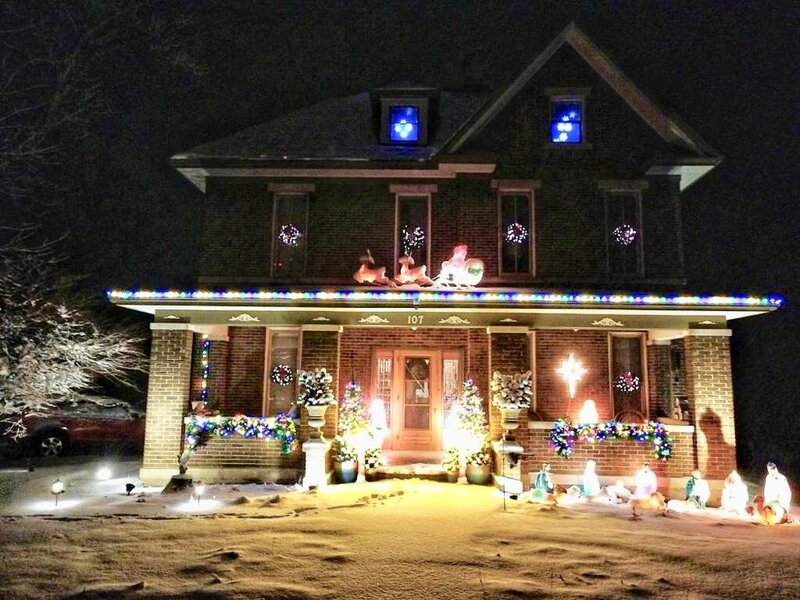 There’s a Christmas cult in that house! It looks like it’s on fire! Gary’s ongoing Santa mug collection.